Today, the President of the Federal Republic of Germany Joachim Gauck and his partner Daniela Schadt arrived in Luxembourg for a three day state visit. 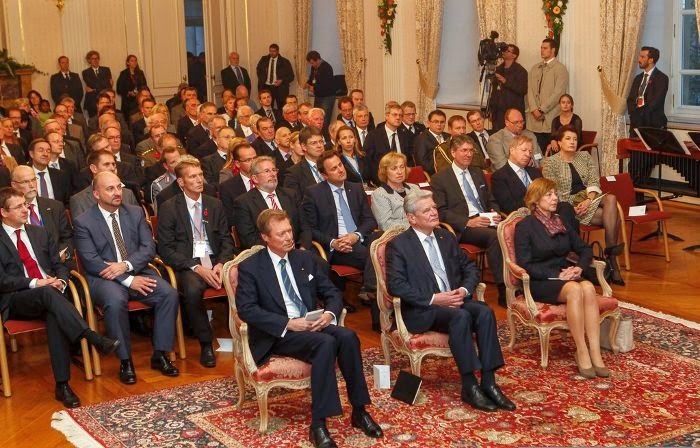 The presidential couple was invited to the Grand Duchy by the Grand Duke and Grand Duchess during their 2012 state visit to Germany, during which they were accompanied by the Hereditary Grand Duke. The last German state visit to Luxembourg occured in 1994 when former President Roman Herzog was received by Grand Duke Jean and the late Grand Duchess Joséphine-Charlotte. 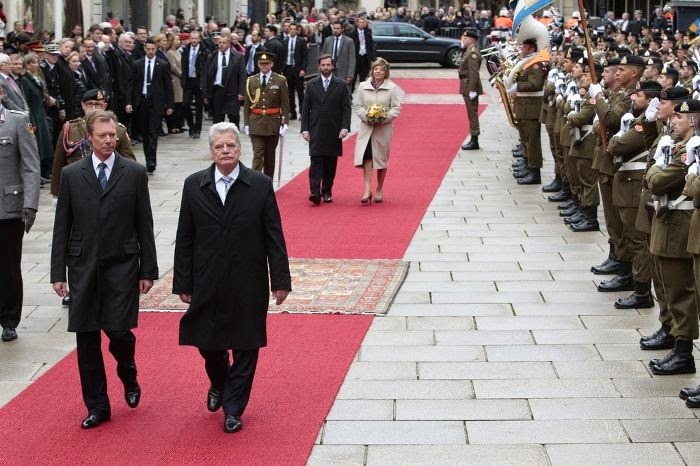 After their arrival by plane at Findel Airport, President Gauck and his partner were welcomed in front of the palais grand-ducal by Grand Duke Henri and Hereditary Grand Duke Guillaume. (The Hereditary Grand Duke and Hereditary Grand Duchess will take over most of the first lady duties during the upcoming days as Grand Duchess Maria-Teresa is still recovering from her knee surgery.) After military honours, national anthems, the review of the troops and the presentation of the respective delegations, the German guests and their Luxembourgish hosts paid a visit to the Monument National de la Solidarité Luxembourgeoise on the Kanounenhiwwel to lay wreaths and pay their respects. 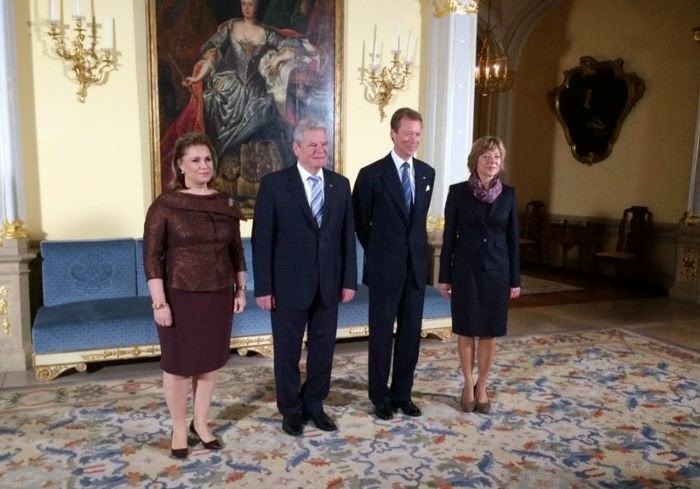 Afterwards, a private luncheon for Joachim Gauck and Daniela Schadt was hosted by Grand Duke Henri and Grand Duchess Maria-Teresa. The lunch at the palais was also attended by Hereditary Grand Duke Guillaume and Hereditary Grand Duchess Stéphanie. While the German President then met with Luxembourg's political leaders, his partner and the Hereditary Grand Duchess (wearing Diane von Furstenberg) visited the Péitrusshaus Shelter in Luxembourg city. They were accompanied by the Minister of National Education, Childhood and Youth, Higher Education and Research, Claude Meisch, Luxembourg Mayor, Lydie Polfer, and the President of the Solidarité Jeunes association, Marco Wagener. The Péitrusshaus Shelter offers a home to young people aged 12 to 18, who are in distress and provides them with emotional support. 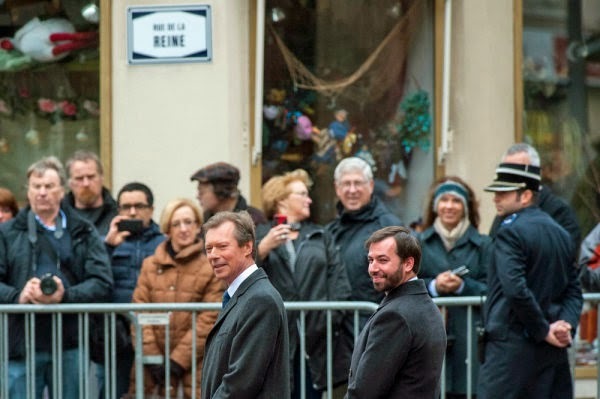 Together with the Grand Duke the presidential couple then paid a visit to the Hôtel de Ville for an academic session. And about now the best part of any state visit (at least for shallow me) is starting: the state banquet. Let's keep our fingers crossed that there will be tiaras. In any case, there will be an extra post about the banquet coming up once pictures are available. Pictures and videos of the day are available at Wort in German, Wort in English, Tageblatt, L'essentiel in French, L'essentiel in German, the Luxembourgish government, the cour, RTL and APA.